The Royal Mile in Edinburgh is the greatest street in the entire world. Yes, that’s a bold statement, and yes….. having lived in Edinburgh for 12 years I might well be biased. But that doesn’t mean I’m wrong! Exploring the Royal Mile is definitely one of the best things to do in Edinburgh. In any case, I can’t find anyone anywhere or the internet making the same claim about anywhere else, so when I say that the Royal Mile is The Greatest Mile in the World, I actually feel like Neil Armstrong planting a flag on the moon. Now, I admit that The Royal Mile is up against some pretty serious competition, and I also realise that different people would use different criteria to judge which street was the best. If you’re into shopping more than history, for example, you might have a different opinion. So let me outline the criteria I’m using which brings me to the conclusion that The Royal Mile in Edinburgh is the greatest mile in the world. Any street claiming to be the Greatest In The World has to have its fair share of tourist attractions. Why? Well, if you’re going to visit the street from the other side of the world there had better be plenty to see and do! Thankfully, there is. The Royal Mile has more than its fair share of tourist attractions. The attractions listed below aren’t listed in order of their popularity, or by what my personal opinion of the best one is. The Royal Mile sits on a long, sweeping hill, so I want you to imagine that you’re walking from the top of the Royal Mile down to the bottom as you scroll down the page. So - in order of decreasing altitude - here are all the things to do in the Royal Mile. Edinburgh Castle sits in a commanding position overlooking the rest of Edinburgh. Discover the dramatic history of the castle, visit the museums within (including the Royal Regiment of Scotland Museum, which tells the story of life in the regiment since its beginning in 2006), enjoy lunch at the cafe and buy a little something at the gift shop. Edinburgh Castle is Scotland’s number 1 tourist attraction. Another 5-star tourist attraction! Choose a tour from 50 minutes right up to 3 hours depending on how much time you have. You can even become part of the whisky making process in the ‘virtual distillery’. A great way to learn about Scotland’s most famous export. Book a Scotch Whisky Experience here. A very entertaining ascent through the building will take you through the world of illusions. Children absolutely love it! At the top, you’ll find unrivalled views of one of the world’s most beautiful and enchanting cities. This is a really quick stop and I almost didn’t include it because…… people traditionally spit on it. The Heart of Midlothian is a heart-shaped mosaic built into the pavement near Parliament House. It marks the spot where the door to the Old Tolbooth (prison) used to be, which is where executions used to take place. Some people spit out of tradition to show their contempt. Heart of Midlothian is also the name of one of Edinburgh’s football teams (the other being Hibernian) and their crest is based on the heart. The focal point for the Church of Scotland for over 900 years, St Giles Cathedral is also known as the High Kirk of Edinburgh. A quite incredible building with a lot of history. St Giles is the patron saint of Edinburgh. Founded in 1999, Edinburgh’s City of the Dead Tour has been hailed as Britain’s Best Ghost Walk, as voted by Scream.com, Yahoo! Travel and Virgin Media. Not for the feint hearted, although they are happy to arrange kids’ tours. Receives rave reviews. Highly recommended. Located beneath (and accessed from) the Royal Mile, Mary King’s Close is one of Scotland’s most historic places and most informative tours. The tours last for 1 hour and will allow you to meet the residents of the close and learn about Edinburgh’s dark past. This beautiful bronze statue was unveiled in 2008. Adam Smith is one of the most intelligent, articulate and insightful thinkers ever to have lived. Economist, philosopher and author of one of the most influential books of all time, The Wealth of Nations. The newly refurbished Museum of Childhood was the first museum anywhere in the world dedicated to childhood. A hugely entertaining look at toys and games through the ages give visitors an insight into what it was like growing up in another time. Visit this impressive venue to enjoy live storytelling performances, music, theatre and more. Storytelling is a seasonal activity, although it’s possible to book your own storyteller on their website. A lovely bookshop and popular cafe make this a very interesting place to visit for all the family. I tip my hat to the curators of this museum. It’s unique in that the displays are based on the spoken words of real Edinburgh people throughout the last 200 years. The People’s Story Museum gives an insight into what their life was like and covers a broad spectrum of issues including arts, objects and employment. Unique, fascinating and totally recommended! There’s free entry and something for people of all ages at the Museum of Edinburgh. The buildings that house the museum are a bit of a rabbit-warren but that only adds to the feeling that you’re looking back through time. They were actually featured in the hit TV series Outlander! If historical objects such as costumes, arts & crafts and Scottish pottery are your thing then you’ll enjoy this stop. The parish of the Canongate Kirk includes both the Palace of Holyroodhouse and the Scottish Parliament. Not a bad catchment area! It’s an incredible historical building with fascinating architecture. The Queen’s granddaughter, Zara Phillips, got married here in 2011. Her Majesty The Queen and HRH Prince Phillip were in attendance at a Sunday service in 2016. Well worth visiting. Whilst the Scottish Parliament building splits opinion (not least because it cost over £400m to build - more than 10x the original estimate! ), the outlook does not. It overlooks Holyrood Park and the dramatic Salisbury Crags. Both guided and self-guided tours of the building are available, taking around 30 minutes and 1 hour respectively. Check before going though, as access is occasionally restricted for obvious reasons. You would expect the Queen’s residence in Edinburgh which sits prettily at the bottom of the Royal Mile to be fairly grand, wouldn’t you? Well, it is. Take the tour to learn about the Palace’s history which includes tales of Mary Queen of Scots and Bonnie Prince Charlie. The fine plasterwork ceilings have to be seen to be believed, as do some of the fine works of art in the Great Gallery. Holyrood Abbey is accessed from the Palace of Holyroodhouse, but deserves to be included on its own merits. Founded in 1128, the Abbey is in ruins but that won’t stop you from gazing in awe at the skill of the stoneworkers who built it. A very grand list of people have been buried here. Interesting fact: ‘rood’ is an old word for cross. There are other things on the Royal Mile that didn’t even make the cut. Incredible, right? I hope you’ll agree that this makes for an absolutely phenomenal mile! Why should accommodation be considered when deciding on the best street in the world Personally, I think it’s nice when a street is more than commercial. People (lucky people!) live in the Royal Mile and the people make it real. And let’s not forget all those people who want to visit the place and need somewhere to stay! 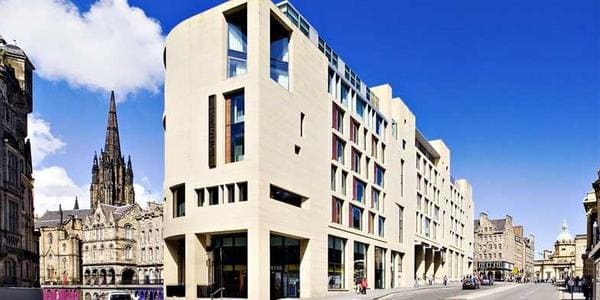 Situated on the corner of the Royal Mile and George IV Bridge, this hotel is fully equipped to provide you with a memorable stay. 5 star service and 5 star prices. Very, very stylish luxury self-catering apartments available for stays of 2 nights or more. Worth booking the St Giles apartment for the view alone. Apartments Royal have several apartments throughout the city. The Royal Mile apartment is a second floor apartment which sleeps up to 4 and has free WiFi. A family-friendly 4-star hotel with a great location. Features a spa, fully equipped gym and indoor heated swimming pool. Very popular with a trendy bar on the premises. Car parking available nearby, which is pretty unusual for a city centre hotel like this! Guests absolutely love this place and rave about it in their reviews. It’s everything a backpacking hostel should be: warm, clean, friendly and full of character. Superbly located budget accommodation. Choose from 146 stylish (and very new!) apartments in the Royal Mile. The Aparthotel has thought of everything from air conditioning to black-out blinds. Guests are loving it. The Royal Mile has a great range of accommodation to suit every budget. Be sure to check out our guide of where to stay in Edinburgh if you’re looking elsewhere in the city. The Royal Mile is famous for having a large variety of small independent shops. You won’t find any big name department stores here, but you will find plenty of charming shops full of fine Scottish produce and souvenirs. You’ll find that a lot of the shops sell similar things so I won’t list them all. Instead, we’ll list our favourites. Scotland is rightly famous for the quality of its cashmere wool clothing, which is as lovely as it is soft. Menswear, womenswear, gloves, scares and accessories of the highest quality. Scotland is also famous for its whisky, and Royal Mile Whiskies has a huge range from all around the world. In fact, Royal Mile Whiskies has been awarded the Whisky Magazine Retailer of the Year Award 8 times in the last 15 years. As recommendations go, they don’t come much better! It’s nigh on impossible to walk past this shop: the beautiful smell of freshly baked fudge just draws you in! The owner is a real artisan. The fudge is absolutely delicious and you can also buy ‘make it at home’ kits which make for the ideal gift! One of the inescapable facts about the Royal Mile is that a lot of shops sell the same kind of things. Not Two Skies, however! If you want a memorable Scottish souvenir, then pop in here to see some of the most unusual jewellery and gemware you’ll ever see. It’s just incredible what they can use to make jewellery. Well worth a look. Quintessential Scottish food, drink and gifts from this popular shop. A huge range of oatcakes, marmalades, jams, shortbreads…. You can even buy some Scottish dog treats! Great gift-wrapping service too. 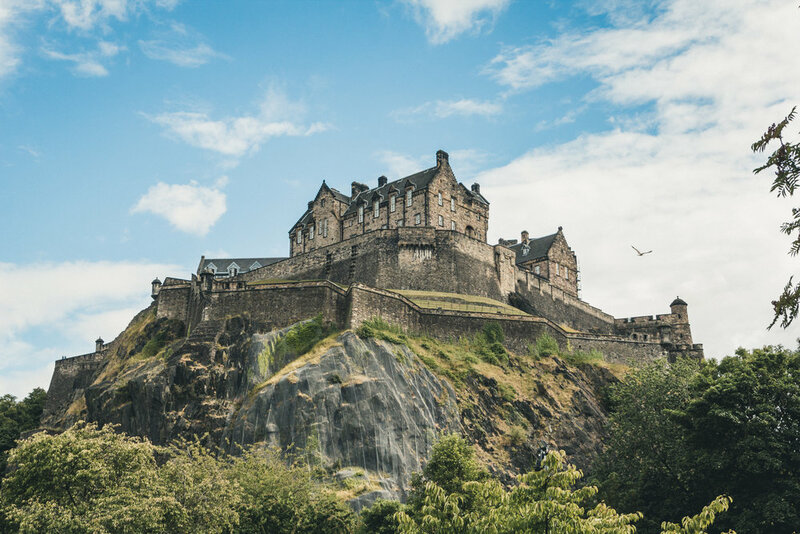 Cobbled streets, magnificent buildings and stunning architecture would be enough to write about, but no guide to the Royal Mile would be complete without mentioning the Edinburgh Fringe Festival. The Edinburgh Fringe Festival is the biggest arts festival in the world. It takes place every year during the month of August and attracts insanely talented people from all over the world. 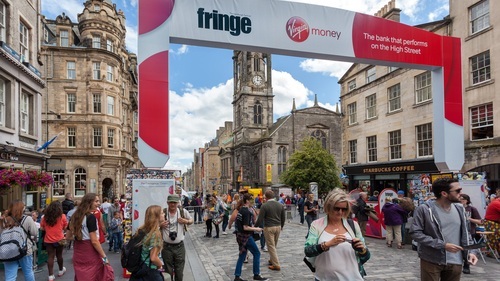 From street performers and comedians to actors, musicians and magicians, the Edinburgh Fringe Festival ought to be on everyone’s bucket list. The city does become busy during this month. Accommodation is pricier than normal and it sells out fast. Want to guess which street takes centre stage? That’s right: The Royal Mile. The Royal Mile (or any street for that matter) just wouldn’t be the same if it had been built yesterday. The history of the place definitely adds a bit of wow factor, even if you’re not a history buff. Let’s start at the top of the hill again and walk downwards. The building at the very top of the Royal Mile is Edinburgh Castle. The castle sits on a rock formed by an erupting volcano over 300 million years ago. Edinburgh Castle was built in the 12th Century. A little further down the hill you’ll find Parliament House and Parliament Square, both of which are stunning to look at. Parliament House contained the Courts of Law and the Scottish Parliament as far back as 1630. You’ll also find the Heart of Midlothian: a famous mosaic in the shape of a heart which marks the location of the Old Prison to which Sir Walter Scott applied the moniker ‘Heart of Midlothian’. The Old Prison was demolished in 1817. Further down the hill you’ll pass St Giles Cathedral, which is also known as the High Kirk of Edinburgh. This building dates from the 14th Century, and was extensively restored in the 19th Century. 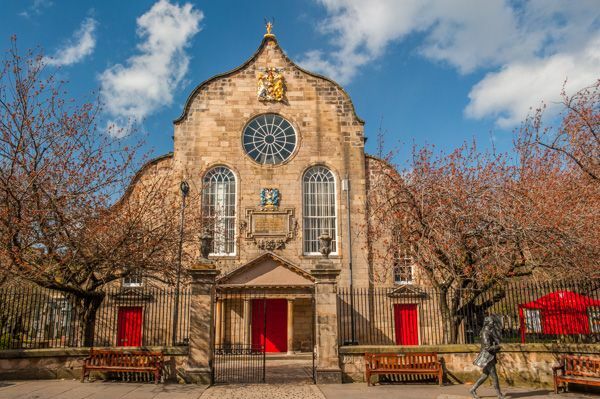 It is still attended by members of the Royal Family (as is the Canongate Kirk further down, which was the venue of Zara Phillips and Mike Tindall’s ceremony). It says a lot that the Canongate Kirk isn’t even the most famous Kirk in the street. At the bottom of the hill you have the Palace of Holyroodhouse, which has served as the official residence of the British monarch in Scotland since the 16th Century. Also within those ground are the ruins of Holyrood Abbey, which was built in 1128. Opposite the Palace is the new Scottish Parliament building, which brings its own little bit of modern history. The Scottish Parliament building was opened in 1999. The Palace and the new Scottish Parliament building are overlooked by Arthur’s Seat, the main peak in Edinburgh which affords spectacular views. Arthur’s Seat was formed by the aforementioned volcano erupting over 300 million years ago. That’s a fair amount of history, right? I’m sure you’ll agree that no street could claim to be the world’s greatest if it didn’t have some awesome eating and drinking establishments. The Royal Mile has many. Here are the best of them, starting from the top and walking down the hill. Part of the Scotch Whisky Experience, you can dine beneath the ramparts of Edinburgh Castle. Very well reviewed casual dining experience using locally sourced products. 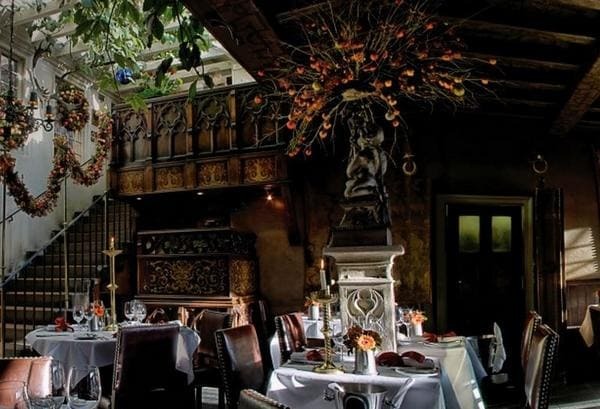 Legendary dining in a legendary location, the Witchery is accessed from near the top of the Royal Mile but is well hidden away. The restaurant itself has a secret garden! You can also stay here in one of the boutique rooms. Many honeymoon couples do just that. Stunning. Wow. A fantastic place for a special occasion. Eating at The Colonnades at the Signet Library is sure to be remembered for the unique surroundings, being set in the lower library and surrounded by books. Arguably Edinburgh’s best afternoon tea location. The caterer’s have received the much coveted Royal Warrant. The name of this place doesn’t leave much to the imagination. This place only uses Aberdeen Angus beef sourced from an award winning farm in Fife. With a good selection of local beers on offer, the Burgers and Beers Grillhouse is a solid offering. If seafood is your preference, then the White Horse Oyster Bar is where you should go. Offering the best of British seafood, think small plates, sharing platters and expertly made cocktails. Renowned chef Paul Wedgwood offers fine dining with any hint of pretentiousness. Friendly surroundings, superb location and a dazzling menu which is changed 4 times a year along with the seasons. Paul Wedgwood is well known for growing and foraging for his own herbs. Variety? What else can I say? See items 1-6 above! We honestly aren’t aware of any other street in the world which matches the Royal Mile in terms of variety. Royal residences, both past and present? Check. Most popular tourist attractions in the country? Check. Accommodation from 5 star hotels through to backpacker hostels? Check. Home to the biggest arts festival in the world? Check. This is why I believe that the Royal Mile in Edinburgh is well deserving of the title of The Greatest Mile in the World. Visit it, and you’ll fall in love. Looking for other things to do in Edinburgh? Read our guide!